Wife of one president and mother of another, Barbara Bush was an outspoken first lady who looked more like her constituents than did her predecessors. A White House resident for only four years, she nevertheless became and remains one of the most admired women in the world. 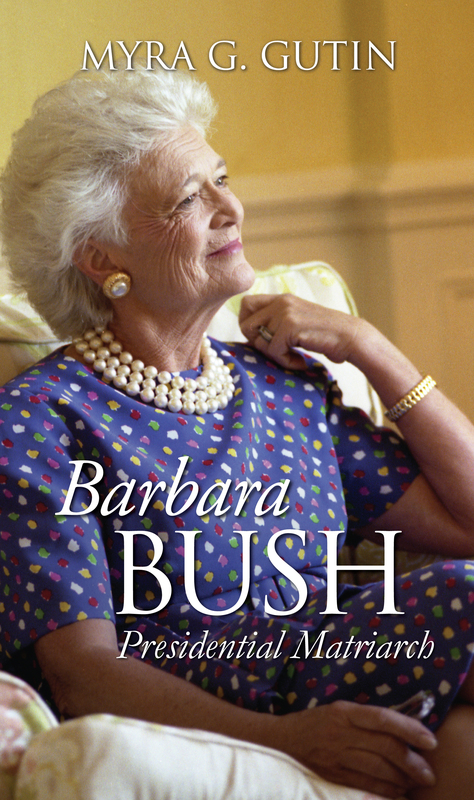 This new look at Barbara Bush draws on recently opened records at the Bush library, the first lady's many speeches, interviews with the first lady's staff, and an exclusive interview with Mrs. Bush to impart a new appreciation for this beloved former first lady. And while other biographies—and her own memoir—have hinted at seeming contradictions in the Barbara Bush persona, Myra Gutin looks squarely at her White House years to set the record straight and show that she was more than "America's Grandmother" in faux pearls. Gutin's portrait reveals a woman who was more of a success as first lady than her husband was as president—who in many ways was the public face of the George H. W. Bush administration. And while she wasn't an innovator as presidential wife, Gutin shows how the "Silver Fox" used her rich experience in politics to master the public relations side of first ladyship with as much skill as any White House spouse. Gutin argues that Barbara was more politically astute than George—even though she denied any input into policymaking and maintained an apolitical image. In fact, she played an integral role in campaigning, fund-raising, and other activities that often blurred the line between the humanitarian and the political. Piercing through the first lady's public persona, Gutin reveals Barbara's backstage political skills in action—along with her closely held views on social issues like gun control and abortion. From behind the faade of an ideal American family, Gutin also includes frank accounts of George H. W. Bush's alleged adultery and of the death of the Bushes' daughter Robin. In addition, she lends new insight into Barbara's relationship with her mother, her role as entertainer, and her role in wartime. Gutin gives us a vibrant woman who lent warmth to her husband's cool image and whose legacy lives in the Barbara Bush Foundation for Family Literacy and several best-selling books. It is a richly textured narrative that depicts a woman of loyalty, candor, and common sense, who knew when and how to apply those qualities in the service of her husband. Myra Gutin is professor of communication at Rider University and author of The President's Partner: The First Lady in the Twentieth Century.